The race didn’t go according to plan but it’s a marathon, and it’s the Boston marathon so not going according to plan should be expected. Coming into this weekend my goal was to run somewhere in the 2:48 to 2:49 range and break 2:50. My training had been at 2:45 paces this season so this seemed reasonable given the physical and mental difficulty of the Boston marathon course. 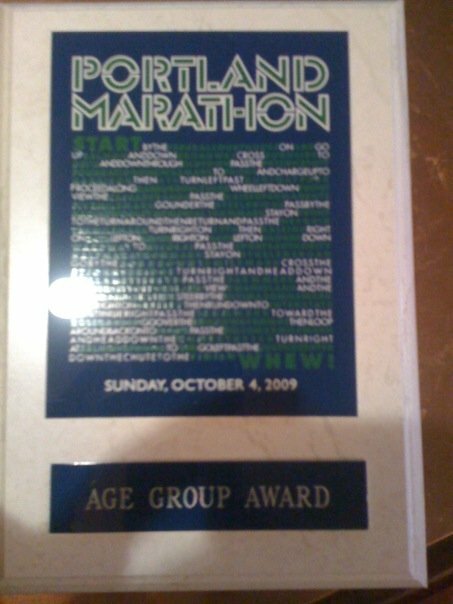 What I ended up running was 2:53:27, my second fastest marathon and a Boston PR by over 7 minutes. This is the best I could do on the day and I’m satisfied with it. The race did reinforce the to me that to perform at my potential I need to be mentally committed to my goal early on in the season and have that in mind during my training, in the weeks leading up to the race and on race day. That is something I didn’t do this season and that more than anything else is why I think I didn’t manage to race at a level my training would have indicated me capable of. When this season started I said to myself if I’m in 2:45 flat marathon shape I’ll try to break 2:50 at Boston, otherwise I’ll try to run a sub 3 hour marathon and pace some team members. I was training at 2:45 paces but mentally I just wasn’t hungry enough this season. Other things in life including work had to take priority in my mind over a command performance at Boston. Do I regret that, kind of but not really. Running is what I do for fun, it needs to be what helps me relax and if it becomes the source of stress in my life I don’t think I’d continue doing it. So the 2:53 marathon I ran at Boston two days ago is what I deserved based on what I put in and I’m happy with it. The race started off well. Muz and I planned to hold our effort in check until we reached the Newton hills. Our goal was to average 6:25 to 6:30 minutes per mile for the first 16 miles. We were a little fast the first 3 miles but got things back in check. We avoided getting carried away like others when there were lots of people screaming, running according to our race plan. The original plan was to pick my effort up in the Newton hills to my 2:45 marathon MGP pace effort. I decided I’d try it even with the sore squads. You just never know in a marathon how your body will respond. I did fine on the first hill but my legs just stopped responding after that, I had no push-off. 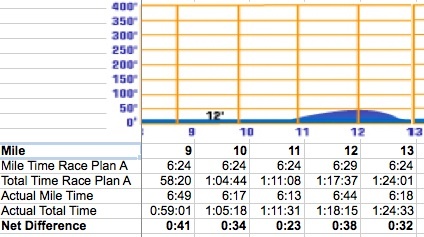 The original plan also called for pushing to Steady pace (6:10) after the Newton hills so once again I tried to surge. My surge effort put me at a 6:30 pace at mile 23 and after that if it wasn’t downhill where I could let my body just roll forward I couldn’t get any significant push-off. The final miles were at a 7:00 minute/mile pace and mentally some of the toughest miles I’ve ever run in a marathon. In the 7 marathons I’ve run before this I never experienced what I did on Monday where my body just wouldn’t respond. The surges were an attempt by me to snap my mind and body out of the pain but it just wasn’t enough. As I said earlier a lot of this probably has to do more with my mental state leading up to this race and during it. My heart just wasn’t in it, I was going through the motions and didn’t have the right attitude to perform at peak. The real dilemma for me is my training and racing moving forward. My goal is to break 2:45. 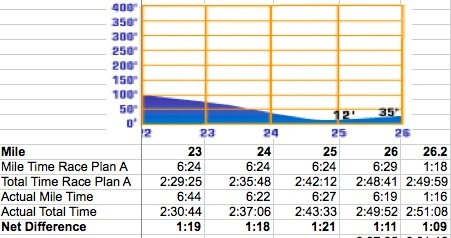 I know I should take it easy and break 2:50 first but I’m being honest … my goal is to break 2:45 … end of story. The question I haven’t answered to myself though is do I really want it and am I going to mentally commit to making it happen. There are a lot of unknowns as far as the rest of my life through the end of the year so I can’t answer this yet. But it is something I’ll be spending quite a bit of time thinking about over the next month and a half before the team starts training for CIM. Talking about the team, I can’t say enough about the people in Team Rogue. I find myself motivated to run and perform well by the example many of they set. If I do commit to making a go at a command performance at CIM each of them will be a big part of the reason I would prioritize this over other things in life. This is my take on the race and it’s different aspects, not all of them but the ones that stood out. Fast but not as fast as a quick look at the profile on the site suggests. There are some serious rolling hills and if you go fast ok the downhill you will pay the price with your quads. The last 6 miles are blazing fast as long as you run a smart race. They came to the hotel. School busses and they were heated. Best part, when we got to the start they idled and left the heating on … and you could sit in them and stay warm till the start. The start had 250 of them all lined up. Plenty for the number of runners, I’ve never seen this at any other race. Very wide road and start. Very inconsistent. The early ones had plastic cups Whig were very hard to use. At some stops it was water first an then Cytomax and at others the reverse order. At some the cytomax cups had cytomax and at others those had water. Some had 3 tables and 15 people and some had one table with 2 people. You just didn’t know what you were going to get. Very tall signs you could see a quarter mile away. And there was somebody reason out your gun time, pace and projected finish time at pretty much every mile. First off, I don’t believe in relying on pave groups since the race is my race and I should know what I’m doing. We had people from under 3 to 4 and a half hours and only one or two pace groups were good. The pace groups tended to run the race based on their fitness, banking time early and then giving time up. I crossed the half at 1:29:58 and the 3 hour group was nowhere to be seen. They went across in 1:28:30 (two of my team mates were with them). Apparently the secobd or third mile was around a 6:30! This is fine for a 2:35 marathoner like the pace group leader but insanity for the people with him that are closer to their limits. We can’t handle the same pounding on our quads or the lactic acid buildup and suffer later on. At the start there were 50 or so people with the pace group, when I passed the pace group at 22 miles there were 5. And this wasn’t the only group that did that, our coaches were out in the course and this was the trend. Going out blazing fast and then slamming the breaks at the last 4 miles to get in at the groups time isn’t pacing, it’s just trying to get in at that time for you. That said, people should run their own race … however pace groups should really not have plans that 90% of people will fail with. They had all then roads completely closed, 4 to 6 lanes! After that if was waiting for the bus. Got on the bus with the 3:10 train and Charles, Larry and Ken. We got to the start and took our turns visiting the ports potty, I made two trips. 20 Ni utes before the start I made it to the bag drop off and then went for a 5 mile warmup. I saw the 3 hour pace group and got close to them and then saw Charles, Ken and Jim and joined them. Then off to the races. 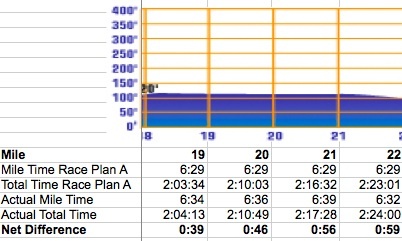 I knew from the email from the pace group leader that they were going out fast, first half goal of 1:28:40 which makes no sense to me for people at their limit. There seemed to be 50 to 70 people with the group then. They peeled away from me at the start as did Ken and Charles. I wanted to hold back. I was glad I didn’t push it on the downhill start. Time to slow it down, negative splits I’d the goal. Sweet my goal is 6:52 to 6:53 average pace through 19 miles. I take my planned thermolyte pills at 2.5 miles. I carried my own small ozarka water bottle (with tap water) to avoid the rush of people and used that to wash down the pills. When I took my pill bag off my safety pin opened and I lost 3 bags or 6 pills … which were foe the rest of the race but luckily I doubled up since I had a similar issue on a training run. At this point the 3 hour pace group is nowhere in sight. I’m ahead of pace and they have to be a half a minute if not more ahead of me. This has to be the worst pacing, it might be fine for the pacers but people at their limits cannot deal with the lactic acid build up, it kills us. More on that later, remember the 70ish size of the people with the group at the start, I’ll have more on that around 22 miles. At this point there are a few people with a red Gecco of lizard trying to run a 3 hour pace pulling away from me. Thermolytes but this time I hold all the pill bags and same issue so I drop them but pick stop and pick them up. At this point Fred is with me and stuff the pill bags into my gloves. Fred and I pretty much run with each other for the next 10 miles, it was nice to ha e a familiar face there. Mile 9 – 6:56 and overall time of 1:01:55 which is 5 seconds slower than overall goal time. No worries I’m negative splitting. Start feelingy quads at this point buy I figure I need to give it time. Mile 10 – 1:08:44 overall and within two sec of 3 hour pace goal! Chickens. 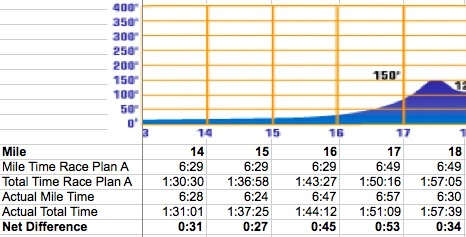 Mile 16 – 1:50:00 (1:40:55) Keep holding it back. Jim from Team Rogue who I saw at the start passes me and says something. I’m so focused I had no idea who it was till half a mile later when I finally saw hi and wish him good luck. Mile 17 – 1:56:46 (1:56:47) Need to keep this going till 19. We cross the bridge (last hill) and I tear off my 3:10 pace band, scream is that all this course has got and throw it at some poor guy on the side who looks a little surprised at my actions. I see the three hour pace group, with 5 or 7 people … that is not good for such a big group. I also see the Gecco uniforms that I pass (except for one who was way ahead). I’m getting closer to the three hour pace group, within 15 feet. I’m taking water and Cytomax at every stop since I can’t work my fingers well enough to get my last GU. I pass the three hour pace group. The guy I inch up to starts to pick it up bit I just hold steady and he doesn’t have it in him. Mile 24 – 6:39, 2:44:16 (2:44:52) I’m going to break three hours.